ads state 18K with 15 Jewels. Sure looks like Vassar, and by 1925 it may have both a model name (Vassar) and a name which was still a number (5728ish) depending on which ads we are referencing. 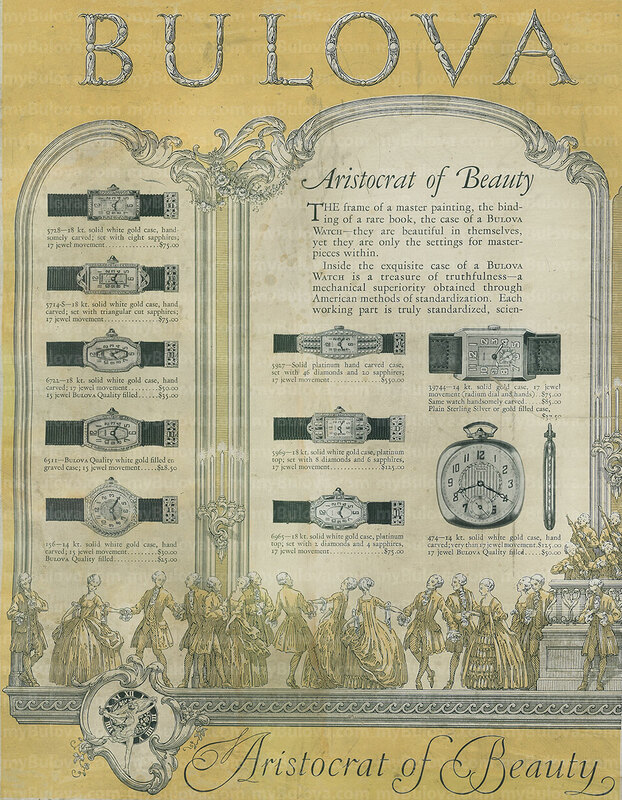 I looked at the inside case backs on some other period close 14k solid watches in the database, and they either had Bulova or American Standard hallmarks on inside case back. For subject watch, I only see 14k stamped on inside case back. 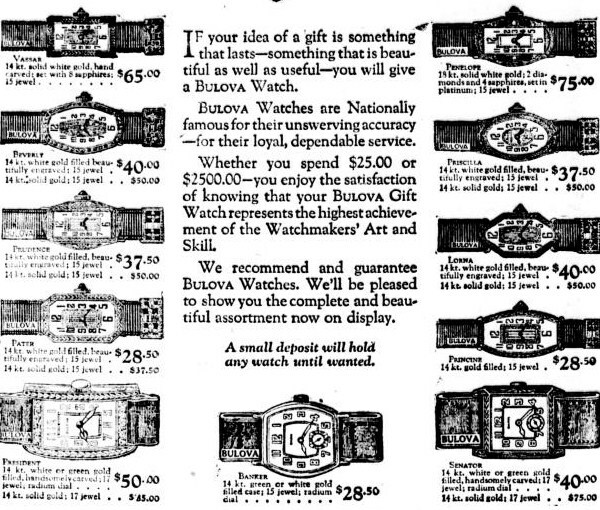 No Am Std or Bulova hallmarks. Maybe I just can't see everything on the inside case back, or maybe it doesn't make a difference in possible model name, or maybe it's a contract case or a non-Bulova case? Root record says "Bulova case manufacturer" ? Under magnification the Case engraving is a match. Hi Mandy, welcome to myBulova. What a beautiful watch! It appears to have been well cared for too. I love the band. What's her story? Is this a family piece? Agree with Vassar ID, tough to decipher those old ad but I think Mark nailed this one. Beautiful watch! 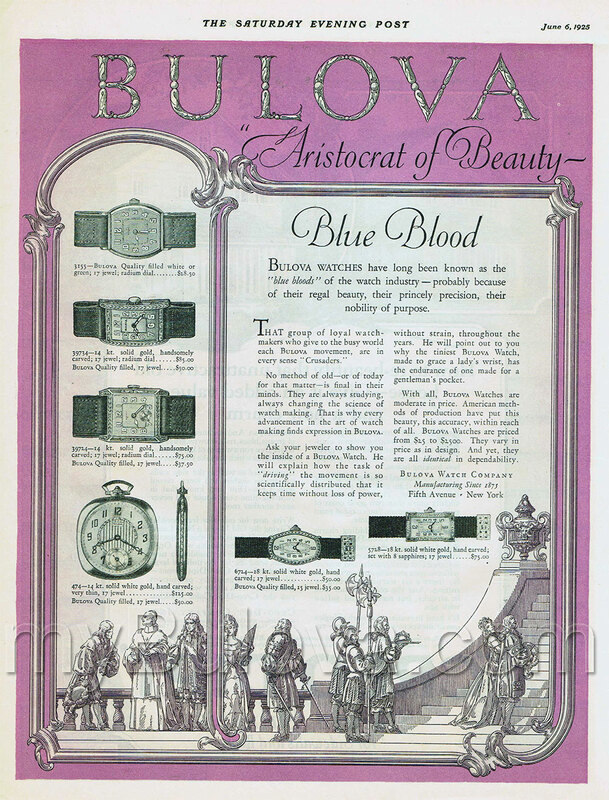 Welcome to the site and the curiously addictive thing that is Bulova. The 5P is the Aurore-Villeret cal. 9. This is also the ebauche for the subsequent 5PP, 5PPI, 5AE, and 5AP. You might think that the AP would precede the others by alphabetical order, but we have seen this is not always the case. I agree with Vassar, nice catch, Mark. 5P serial number 2409?. Looks like the last digit is a 6, but not sure. Still don't see "Bulova" anywhere on the case? Only 14k. Its entered as Bulova under case manufacturer. PM sent.